Plycem USA pruchased the fiber cement siding division from CertainTeed, a major siding manufacturing company. It restructured the formula and improved the product before launching Allura Fiber Cement nationwide. Tested to withstand hurricane force winds, resist fire, termites and moisture. Allura recently won the 2014 Brand Survey for Best Exterior Siding by Peninsula Publishing. Achieve the rustic look of natural cedar shakes without the high cost and maintenance of wood. Allura's shakes and shingles come in a variety of color choices and style combinations. Our authentic cedar shake captures the look of freshly sawn cedar wood shakes with distinctive patterns of randomly sized boards and brilliant crafted finish. For those who prefer the rustic look of real cedar shakes, Fiber Cement Shakes is your dream come true. It provides the appearance of real cedar shake while offering all the advantages of our fiber cement products. Available in 22 colors or 6 stains and per-primed and sealed for painting after install. To visit Allura's web page Fiber Cement Shakes click here. 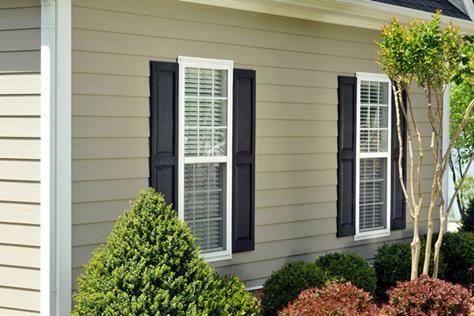 Board and Batten style siding is one of the most popular types of siding. It has been around for centuries and is still preferred today. It is often used on gables and garages for accent. Wide vertical boards were nailed vertically onto the house. A small batten is nailed on the seams to seal them. Today the fiber cement version is recreated to look exactly like the wooden version. Only stronger than real wood with considerably less maintenance. Fiber Cement Board and Batten Vertical panels are available with our ColorMax Finishing System's line of 22 solid colors, featuring the protection of our proprietary primer-sealer that provides resistance to unwanted moisture while serving as a base for quality top coats. Comes in both textured and smooth finish. The always popular traditional lap siding or Clapboard siding is also available in fiber cement board. All the charm and traditional looks of long painted cedar boards. Comes in smooth finish or cedar textured finish. 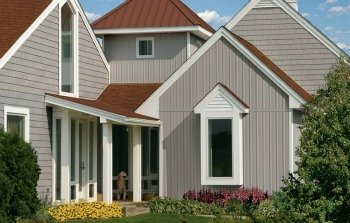 Fiber Cement Lap Siding is available in both Cedar and Smooth premier finishes to match your home's style. 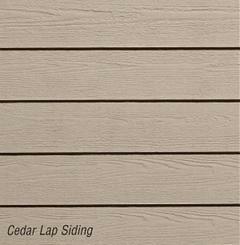 Our Cedar lap siding is manufactured to look like natural wood in various exposures. Our authentic wood-grain appearance is achieved with;our advanced first-transfer system using real cedar boards. Our grain pattern repeats every 48 planks, which is the best in the industry. This means on a 20' x 24' foot wall, Allura planks will only have a maximum of two repeats. To see more information on cement board sidings go to the Cement Board Siding page.. click here.